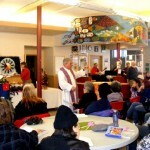 Worship services, Sunday at 11 a.m. - Each week people from the community are welcome to Sunday services in the Bissell Centre West drop-in centre. Though the community gathered is humble and sometimes down-trodden, the sense of God’s presence is evident as we sing, proclaim the good News and pray. All people from the community are welcome, no matter what their condition, how they are dressed or whether they are under the influence of alcohol or drugs (as long as they are not disruptive). Lunch (Sundays at 12 noon) - In breaking bread together we grow closer to one another. This hospitality happens because of volunteers who come from the 90+ churches and synagogues who give great effort and expense to provide the lunch, which follows the worship service. 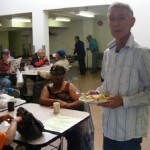 Within this ministry of hospitality and care, the “inner city” and “outer city” grow closer together.